The last day…. and in the morning I did feel some lack of energy, but apart from that I was fine. I’ve lost around 5 Kilograms in weight, which is about par for that reported by other hunger-strikers – you usually lose 1 Kg a day. Today I had a journalist from a Japanese news agency and one from a UK-based Indian agency come to interview me. A Neuropsychology colleague from Cambridge visited, and he updated me on events there. Two policemen visited, but after a quick call to their HQ, which presumably told them I was harmless, they wished me well and went on their way. One thing about a hunger-strike is that you will invariably get disturbed sleep, often because you are waking up in the night with thoughts on your mind as to things to prepare, how to deal with situations, etc. Both physically and mentally, I have been fairly pleased with how I have coped – I think the secret is both physical preparation (I had fasted for one day a week for the past few months) and mental preparation. Mental preparation is the key. For me, as you can see from my earlier ‘What Inspires Me’ blog, I had many reasons for the hunger-strike that drove me. I also thank key organizations and individuals who have supported me. In the case of organizations, three stand out – the British Association of Physicians of Indian Origin, The British International Doctors Association and the British Indian Psychiatric Association. Gandhi’s words and actions were always with me this week, especially as it was his birth anniversary, but I was also inspired by Irish hunger-strikers and in particular by Terence MacSwiney. He was lots of things – a playwright, an accountant, a teacher with a degree in ‘Mental and Moral Science’, Mayor of Cork, and a devoted husband and father to his one year-old daughter. He went on hunger-strike in 1920, after being imprisoned by the British, and he died of starvation in October 1920. His story has been told many times, but a recent book by Dave Hannigan is worth reading, as is the book that MacSwiney himself wrote, Principles of Freedom, where he has an interesting chapter called Moral Force. MacSwiney inspired people such as Gandhi and Nehru in their freedom struggle in India, and in many ways he was ahead of his time. His sacrifice, in dying for his principles in spite of his having to leave behind his young wife and baby, is simply remarkable. In the case of individuals who have helped me, these are too many to mention, but my long-standing colleague Dr Veronica Bradley has, as usual, been a gem. I needed computer support throughout, and Adam Sutcliffe has been invaluable. I was inspired and touched by the complete strangers who came along to my demonstration site and said how much they admired and supported what I was doing. Some of them must have travelled some distance to specially come to see me. Those visits almost brought me to tears. Last but not least, my wife Ritu has been marvellous. We had to take around six bulky items each day on the train, and she did this cheerfully. She also had to fend off calls from family members who asked all sorts of daft questions, such as – Are you supporting him? I read that if you eat fruit it should if possible be on an empty stomach, so my first taste of food after five days was a banana, some raspberries, and later some lentil soup. 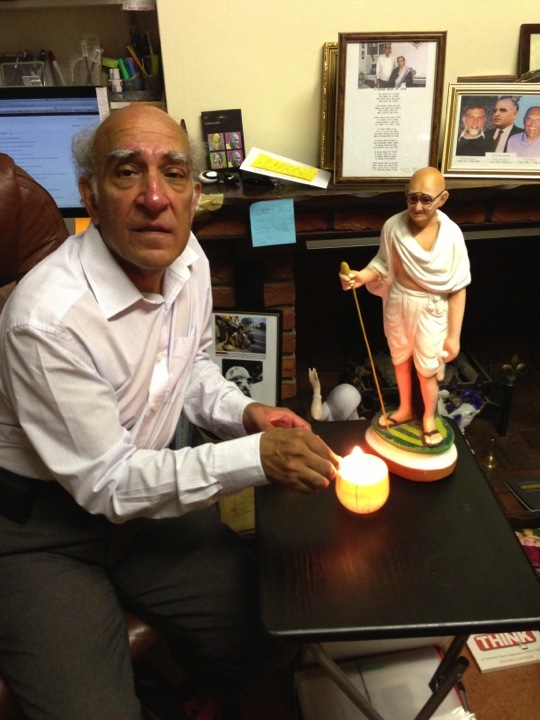 Since I lit a candle at the beginning of my hunger-strike, I thought I’d also light one at the end, with my statue of Gandhi to hand, sort of to thank him for the inspiration he has given me, and here is the photo of this. Someone necessarily assist to make severely posts I might state. This is the first time I frequented your website page and thus far? I surprised with the research you made to make this particular submit amazing. Magnificent process!